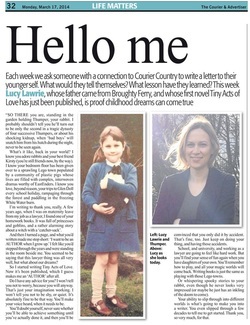 The Sunday Mail's Heather Greenaway interviewed me about Tiny Acts of Love and the primary two homework book that inspired me to rediscover my love of writing. See the article in full here. I was interviewed by Gemma Fraser of The Edinburgh Evening News in the Saturday Edition's Weekender. 10 March 2014 Claire White interviewed me for STV Online and you can read that piece here. I wrote a letter to my six-year-old self for the Courier's "Hello Me" column. You can read it here. 17 March 2014 Best Daily online published an article I wrote about my experience of going back to work after having a baby. A version of this article was also published in the Daily Record on 21 March 2014. 19 March 2014 My article about working motherhood was published in the Telegraph Wonder Women section. 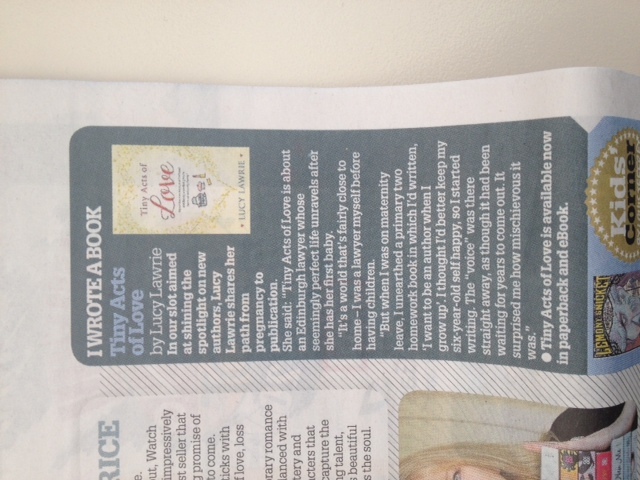 12 April 2014 Tiny Acts of Love was featured in the Daily Record's Saturday magazine.